Blog: A Different Heresy . XXIX.27-42; Tatian's Diatessaron (c. 150-160). "The Parable of the Householder Who Hired the Laborers," Matthew 20:1-16, Martin Luther, c. 1525. "For by an "evil eye" the Hebrews mean "envy", because such dispositions appear chiefly in the eyes, as above in Mt 6:23." "The direct object of this parable seems to be, to show that though the Jews were first called into the vineyard, at length the gospel should be preached to the Gentiles, and they should be admitted to equal privileges and advantages with the Jews." "That some of those who were first called may yet be last, our Lord confirms by the following parable: of which the primary scope is, to show, That many of the Jews would be rejected, and many of the Gentiles accepted; the secondary, That of the Gentiles, many who were first converted would be last and lowest in the kingdom of glory; and many of those who were last converted would be first, and highest therein." "Divine Sovereignty; Matthew 20;15," Charles H. Spurgeon, 1856. "This parable, recorded only by Matthew, is closely connected with the end of the nineteenth chapter, being spoken with reference to Peter's question as to how it should fare with those who, like himself, had left all for Christ." "Our duty in the vineyard is to go to work as soon as the Lord calls us, and to do what he tells us." Commentary, Matthew 20:1-16, Karoline Lewis, Preaching This Week, WorkingPreacher.org, 2017. "Matthew’s parable of the workers in the vineyard -- or is it the gracious landowner, or maybe the union-busting landowner? -- has most often been read as an allegory in which the landowner stands ..."
"The good news is that Jesus persists in telling us the truth about ourselves." Commentary, Matthew 20:1-16, Emerson Powery, Preaching This Week, WorkingPreacher.org, 2014. "Jesus' parable highlights the generosity of God. As the ultimate "landowner," God will use what has always belonged to the Creator for the good of all even if humans fail to view the world through God's eyes." "This parable is a reminder of the absolute gift of generosity that does not demand response, that does not account for reciprocity, that does not calculate metrical measures. Because then generosity is not generous. By definition, generosity is not measurable, accountable, or calculable." "... if forced to choose, which would you take, love or justice?" "However we choose to read the parable, whether spiritually or economically, the word we hear in this passage is that in the kingdom of heaven, the king is generous." "Heaven, God's rule, is a rule that promises generosity in life that for us living in a market driven world which is almost unfathomable – yet this is the kingdom we pray for." "What Is Fair," Rick Morley, 2014. "When I hear the words of Jesus in this Sunday's parable, I am reminded of the problem we have with generosity. We want to control it, to manage it, and to conform it to our vision of what and who is worthy of it." "Money, Manna, Marriage, Mercy," Nancy Rockwell, The Bite in the Apple, 2014. "The Politics of Just Wages," D Mark Davis, Political Theology Today, 2014. "Whether speaking of a 1st century field hand, a 21st century peasant in El Salvador, or a single mother working a minimum wage job with no benefits, the parable of Matthew 20 still arouses indignation among those whose needs are already met." "Surely then, amid our jostling and grumbling amongst any family ancestry claims, class jealousies and denominational allegiances… it is with humility that we are all called by the Spirit to confess our sinfulness, and mutually accept the very graceful gift of forgiveness and salvation." "When have you found your status changed from 'last' to 'first?' How did you react? What would it be like to be able to offer that gift to another? When do you see yourself doing so next? "Nothing to Earn," Alan Brehm, The Waking Dreamer. "The story of the workers in the vineyard insists that in the kingdom God envisions, there is nothing to earn. In a very real sense, we are all "eleventh-hour workers," regardless of what we may have done." Evangelio Comentario del San Mateo 20:1-16 por Javier Ortega Badilla, Working Preacher, 2014. Commentary, Matthew 20:1-16, Karl Jacobson, Preaching This Week, WorkingPreacher.org, 2011. "The scandal of this parable is that we are all equal recipients of God's gifts. The scandal of our faith is that we are often covetous and jealous when God's gifts of forgiveness and life are given to other in equal measure." "Justice Comes in the Evening," ON Scripture, Matthew L. Skinner. Commentary and association with current news events, links and videos. "In the end, it’s not about unfair payments. At the parable’s conclusion, the full-day workers don’t moan that they have been cheated. They complain instead to the landowner, You have made them [the one-hour workers] equal to us." "Crazy Talk Grace," Fr. Rick Morley, a garden path, 2011. "...when God pours out his love and favor towards someone else, we need not worry. If we'd just take the time to look, we'd see that God has filled our cup to the brim too." The Laborers in the Vineyard, audio telling, story in episodes, graphic, audio and written commentaries. Go Tell Communications, Biblical Storytelling for the Global Village, 2011. Holy Textures, Understanding the Bible in its own time and in ours, Matthew 20:1-16, David Ewart, 2011. "Where 2 or 3 are gathered together - in families, friends, or church - the challenge is always: How will we deal with envy when God is generous with some but not all." "The disciples will receive a reward for what they have given up, but they are not the only ones." Comentaio del Evangelio por Osvaldo Vena, San Mateo 20:1-16, Working Preacher, 2011. Commentary, Matthew 20:1-16, Ira Brent Driggers, Preaching This Week, WorkingPreacher.org, 2008. "First Thoughts on Year A Gospel Passages in the Lectionary," Pentecost 15, William Loader, Murdoch University, Uniting Church in Australia. "Our response to people is not to make sure they get their rights, but because they are people and that will often mean going beyond what, according to accepted norms, they have a right to claim. Love of this kind goes beyond human rights." "It might be noted that what kept the rich man out of fellowship with Christ was not anything evil, but, we might call it, "his goodness" -- the keeping of the commandments and the assumption of (divine) blessings of his wealth." "Wages and Gifts," Gospel Analysis, Sermons from Seattle, Pastor Edward F. Markquart, Grace Lutheran Church, Seattle, Washington. Detailed background and exegesis. "In an unforgettable way, Jesus taught that life and salvation are gifts from God, pure gifts, unearned and undeserved. We, his followers, are to live with that awareness." "Employee #00001," The Journey with Jesus: Notes to Myself, Daniel B. Clendenin, Journey with Jesus Foundation. "As he so often did, his punch line shocked his listeners with a radical reversal that subverted conventional wisdom. If we listen carefully today, it should shock us too." "Eighteenth Sunday after Pentecost: Matthew 20:1-16," Transformed for Disciple Community: Matthew in Pentecost, James L. Boyce, Word & World: Theology for Christian Ministry, Luther Northwestern Theological School, 1993. "Matthew 20:1-16, Pentecost 18," Perspectives on the Parables -- Glimpses on the Kingdom of God, Robert H. Albers, Word & World: Theology for Christian Ministry, Luther Northwestern Theological School, 1984. "The Workers in the Vineyard," Rev. Bryan Findlayson, Lectionary Bible Studies and Sermons, Pumpkin Cottage Ministry Resources. Includes detailed textual notes. Wellspring of the Gospel, Ordinary 25A, Catherine McElhinney and Kathryn Turner, Weekly Wellsprings. "Justice in the Kingdom," Larry Broding's Word-Sunday.Com: A Catholic Resource for This Sunday's Gospel. Adult Study, Children's Story, Family Activity, Support Materials. "What is the difference between fairness and justice?" "Intimations of the Year of Jubilee in the Parables of The Wicked Tenants and the Workers in the Vineyard," by Herman C. Waetjen. "Jesus' parables violated the ordered system of land tenure and economic exchange in the world of his day. The rule of God, which his stories metaphorically disclosed, will undermine the ruling elite's self-serving systemic structures and institutions." "Parable of the Workers in the Vineyard," wikipedia. Culbertson, Philip, "Reclaiming the Matthean Vineyard Parables," Encounter, 1988. Fortna, Robert G., "Exegesis and Proclamation, Matthew 20:1-16)," Journal of Theology for Southern Africa, 1990. Grindal, Gracia, "Your God Is Too Nice," The Christian Century, 2002. Hock, Ronald F., "Romancing the Parables of Jesus," Perspectives in Religious Studies, 2002. Jiménez, Pablo A., "The Laborers of the Vineyard (Matthew 20:1-16): A Hispanic Homiletical Reading," Journal for Preachers, 1997. Lebacqz, Karen, "Justice, Economics, and the Uncomfortable Kingdom: Reflections on Matthew 20:1-16," Annual of the Society of Christian Ethics, 1983. Lee, In-Yong, "A Generous Boss," The Christian Century, 2005. Little, Jennifer A., "Marriage - Daily Labor in God's Vineyard: A Sermon," Encounter, 2008. McClister, David, "'Where Two or Three Are Gathered Together,': Literary Structure as a Key to Meaning in Matt 17:22-20:19," Journal of the Evangelical Theological Society, 1996. Robinson, Anthony B., "Wild Zucchini," The Christian Century, 1993. The Unfairness of God, William J. Carl, III, SermonStudio. "Wages and Gifts," Sermons from Seattle, Pastor Edward F. Markquart, Grace Lutheran Church, Seattle, Washington. "A Question of Fairness," 18 Pentecost - 18 September 2005, Luke Bouman, Göttinger Predigten im Internet: Every Sunday Sermons based on the RCL by a team of Lutheran theologians/ pastors. "From Board Room to Union Hall," the Rev. Dr. Norman Pott, Day 1, 1996. "Storypath Lectionary Links: Connecting Children's Literature with our Faith Story," September 21, 2014, Union Presbyterian Seminary. Connections: Exodus 16:2-15 and The Lorax by Dr. Seuss, Philippians 1:21-30 and A Friend for All Seasons by Julia Hubery, Matthew 20:1-16 and A Friend for all Seasons by Julia Hubery. 2011. "The Kingdom of Heaven Is Like a Vineyard," Sunday School Lessons: Family Bible Study, art projects, music, stories, etc. "The Last Shall Be First," Jim Kerlin, childrensermons.com. "Parable of the Workers in the Vineyard," children's study, puzzles, coloring sheet, etc. Higher Praise Christian Center. 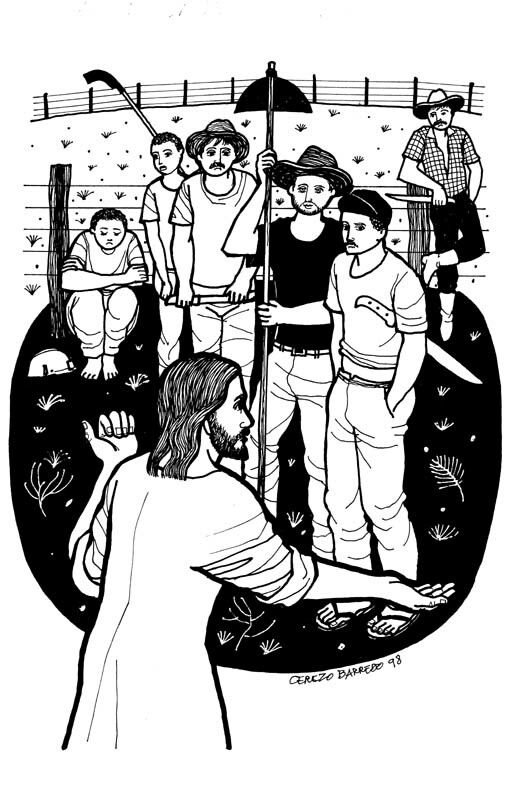 "The Workers in the Vineyard," online computer java-based coloring pages from Grace Baptist Church of Feeding Hill. "The Price of Labour," Andy Lund, dramatix. "No Respecter of Men," Christin Kuck, dramatix. "A Dinar for Each," from A Certain Jesus by Jose Ignacio and Maria Lopez Vigil. Ideal for catechetical and liturgical dramatization of today's gospel. Claretian Publications. Clip Art, Matthew 12:20, 15, Fr. Richard Lonsdale, Resources for Catholic Educators. Matthew 20:1-16, at Cerezo Barredo's weekly gospel illustration. Liberation emphasis. Matthew 20:1-16, Scripture Pics - graphics relating to RCL texts, Matt Baker, Germantown UMC, Ohio. Hymns with Scripture Allusions: Matthew 20:1. The Cyber Hymnal.